Natural Ville Executive Residences offers you luxurious living in the heart of the city, just five minutes walk to the BTS Skytrain. With modern, elegant, specious and above all comfortable apartments, Natural Ville is designed around your lifestyle with a fully-equipped business centre, spa, fitness centre, swimming pool and the world-famous Lenotre Parisian Café at your convenience. Managed by Accor, this well-appointed residence enjoys renowned standards of international style and service. Stunning views across Bangkok CBD day and night make it easy to see why Natural Ville is the refined solution for city living. 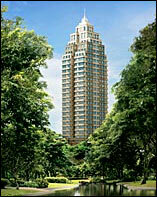 Lumpini Park is at your door step.